Last weekend I had shared Orange peel pachadi in sweet taste. 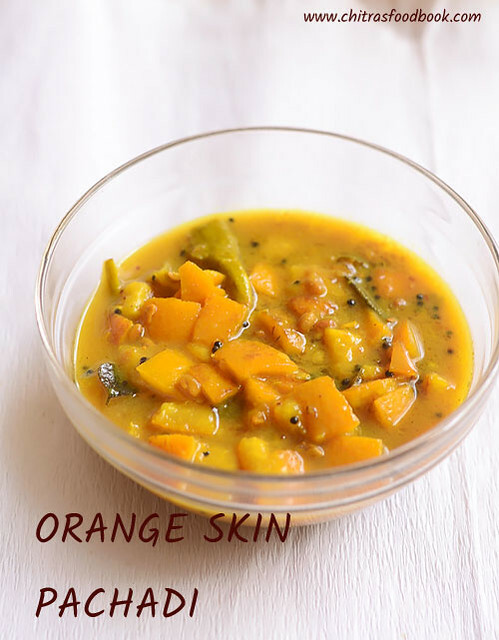 Today’s post is orange skin spicy pachadi prepared by my MIL. 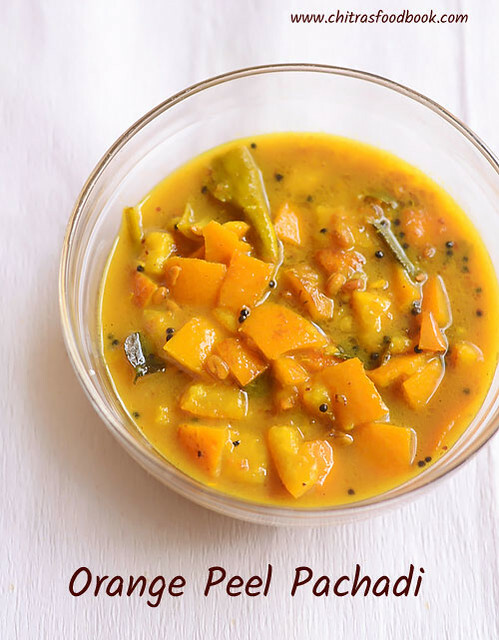 Basically pachadi is a South Indian style side dish recipe in which the ingredients are similar to pickle but slightly different in cooking procedure, taste and semi thick in consistency. We make pachadi with raw mango, ripe mango, citron fruit / narthangai. This recipe is very similar to my Narthangai pachadi but we used orange skin (kamala orange in Tamil). So the quantity of tamarind, green chilli and other spices vary slightly. Its so easy to cook as its done in a pressure cooker. If you have oranges at home, do not throw its skin. Make and consume it in the form of this pachadi and reap its health benefits. Next week I will share Orange skin kuzhambu and orange peel pickle. In the mean time, check out my orange skin sweet pachadi too. Ok, lets see how to make orange peel pachadi recipe in a pressure cooker easily ! 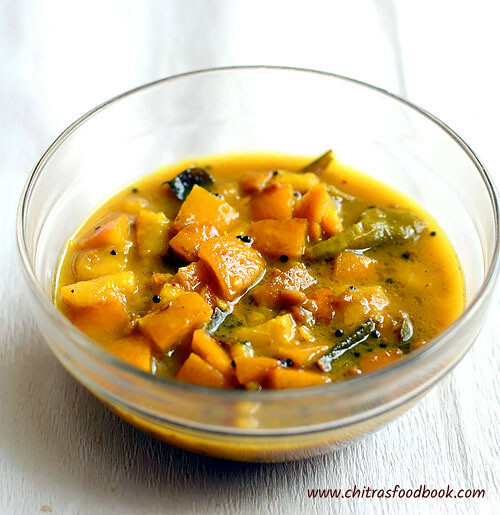 Check out my mango pachadi recipe too ! Spicy pachadi recipe with orange peel. Wash and chop orange skin into small pieces. In a pressure cooker base, take the chopped orange peel, slit green chilli, salt, hing, tamarind extract and jaggery. Pressure cook in very low flame for 2 whistles. Remove the lid after steam is released. Add roasted fenugreek seeds powder, mix well and boil for a minute. Temper mustard seeds in sesame oil and add to the pachadi. Store in a box after it cools down. Wash and chop orange skin into small pieces. Set aside. Soak the tamarind in 1 cup water.Take the required green chilli and slit into two. Dry roast methi seeds and grind to powder.Keep aside. In a pressure cooker base, take the chopped orange, slit green chilli, 1/2 cup of tamarind extract, salt, jaggery and hing. Pressure cook in low flame for 1 to 2 whistles. Open the cooker lid after steam is released. Add roasted methi seeds powder. Mix well and roll boil for a minute. If the pachadi is too watery, you can boil for one more minute to make it slightly thick. Remember this pachadi thickens a bit after it cools down. Check for taste and add more salt if required.Let it cool down. The actual taste of this pachadi can be known after a day or two. Remove the pachadi from cooker to another vessel ( porcelain or glass jar) because it may react. Temper mustard seeds, curry leaves in sesame oil and add to pachadi. Mix well. Store the pachadi in a box only after it cools down completely. Refrigerate it. Stays good for 15 days. But you should reheat it once in 3 days to avoid pungent smell. Enjoy with curd rice! Adjust the quantity of tamarind and green chillies as per the bitterness of skin. I hope the measurements I have given in this recipe works well. If you need it more spicy, add more green chillies sauteed in oil separately. Mix with pachadi . Boil for a minute. The next day, you can get the spicy taste. You may have to reduce the number of chillies if its too spicy. Addition of jaggery balances all the taste. So do not skip it. We like the pachadi to be slightly watery. If you want it thick, just boil for more time. You can use kolingikai or narthangai and make the same pachadi. Try this easy, yummy, spicy pachadi with orange skin and enjoy with curd rice.